Now, I know a French Dip isn't actually French at all - it originated in Los Angeles. But after arriving at one of my favorite restaurants in San Francisco (Absinthe) to find that there was an hour long wait to be seated, I decided to peruse the neighborhood on the south end of Market Street to see if there was somewhere else worth a try. Right across the street, there just so happened to be a French restaurant called Monsieur Benjamin, and as I browsed the menu...well, you know what I found - a French Dip sandwich. Done and done - I had my restaurant picked out. "The portion was just disappointing..."
I wanted an appetizer to start out with, and chose the leek, potato and gruyere croquettes. They came with a dill/herb creme fraiche, and though quite delicious, consisted of 4 or 5 small bites of potatoes for $7.50. The portion was just disappointing, but I still had my hopes up for the French Dip. 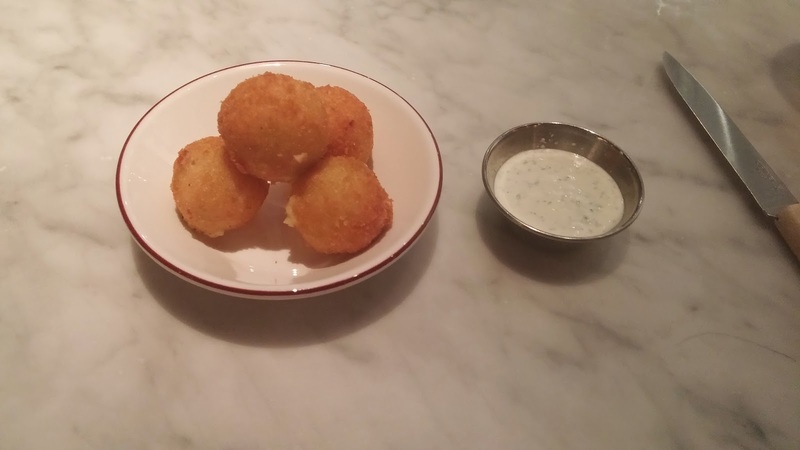 Potato and Leek Croquettes. Yes, this is a $7.50 portion. "When it arrived, the small sandwich, which cost $18.50, was just that - a sandwich." When it arrived, the small sandwich, which cost $18.50, was just that - a sandwich. No fries or any side items. "Oh, you wanted french fries with that? I'll have them right up," the waiter said. I probably had them within 90 seconds of ordering that, but didn't realize at the time that a side of fries was $5. So being that I expect a sandwich to come with a side - whether it's fries, chips, veggies, a salad...whatever - that basically brings the French Dip at this place was really $23.50, very much on the pricey side. "a side of fries was $5." The meat was medium rare to medium, but lacked any flavor whatsoever. Gosh, what a disappointment this place was. The meat was medium rare to medium, but lacked any flavor whatsoever. The creamy horseradish was tame enough for a small child to eat. The French bread nothing to write home about (c'mon, it's a French restaurant for goodness sakes!). The Gruyere cheese - well, you just can't go wrong with Gruyere. That was the only redeeming quality of the sandwich. "The Au Jus: It wasn't salty. It wasn't beefy. It was just sweet, and full of onions." So on to the au jus, what I consider the most important part of a French Dip. I can't begin to describe how much of a disappointment that was. It wasn't salty. It wasn't beefy. It was just sweet, and full of onions. 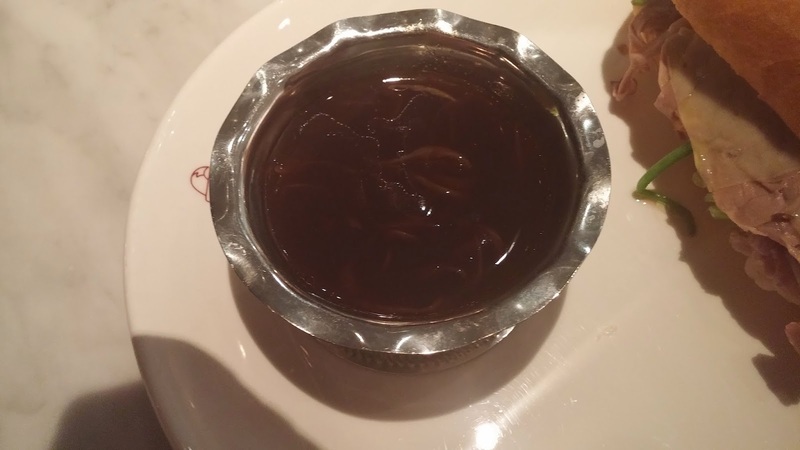 Now, I know that the broth for French Onion soup can very closely resemble a perfect au jus for a French Dip. But they must have used Vidalia onions. Or a pound of sugar. Not sure which, but the jus was just way too sweet. it also had a bit of thickness to it that I just don't like in an au jus. It reminded me of what you get at Quizno's or Arby's in consistency. And Quizno's and Arby's au jus is much better than what I had at Monsieur Benjamin. "...Arby's au jus is much better than what I had at Monsieur Benjamin." 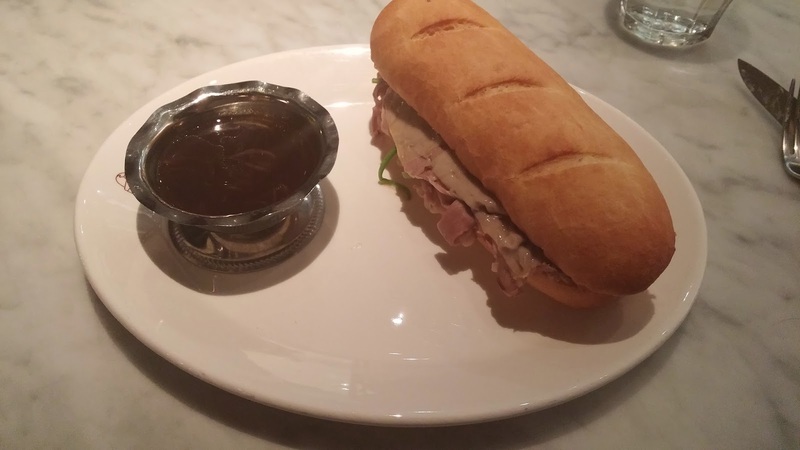 Puny sandwich, meet puny au jus ramekin. The fries were good, served with an aioli and ketchup. But not great. Overall, there really wasn't any part of this meal that I loved. In fact, it all pretty much was below average or average. And the centerpiece of the meal, the sandwich itself, was just a plain disappointment. Not recommended if you are in San Fran and looking for a French Dip fix. This might just be the worst French Dip I've ever had.